Slam, slam. Rev, rev. And away we drove from the Kripalu Center for Yoga and Health in the beautiful Berkshire mountains, away from a five-day retreat called Being Fully Alive: The Joy of Clarity, Strength, and Freedom, away from a fantastic few days with my teaching partner Jennifer Schelter and our new best friends, and away from a week of supporting others and transforming ourselves. Down the hill we went, on a quiet lane laced with trees boasting their peak fall colors of red, orange, and yellow. Trees, trees, oh those trees, that surrounded us in their fiery blaze all week long, keeping us awake. Those trees that seemed to stoke our inner fires, helping us burn through any false sense of self that still lingered. As we turned away from Kripalu, Jennifer and I turned to each other and smiled. We had done it. Not only did we facilitate a weeklong retreat at this world-renowned center, but in our estimation, we nailed it. We stretched ourselves by teaching new material. We experienced deep intimacy with complete strangers by holding space for them to reflect on their lives. We hiked the hills, swam in the lake, stood in front of crowds and sat alone with ourselves. 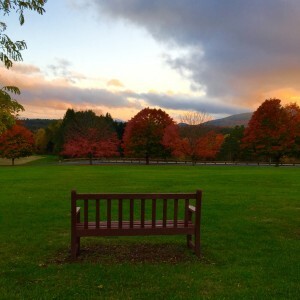 We drove away from Kripalu, down the quiet lane and headed home. But the magic of the week wasn’t over just yet. The roads through the magnificent Berkshire Mountains seemed to be on fire with color, further stoking the flames of transformation that were burning inside both of us. The vivid colors sparked our curiosity and kept us awake. We “ahhhed” at the sight of the sunlight tapping the top of the orange tree and “oooed” at the rolling hillside bursting with red, orange, and yellow. For the next five hours we remained awake, alert, and fully alive. We never stopped talking. We downloaded the week—day by day, class by class, student by student. We offered each other honest feedback for growth and encouragement for what is possible. What does your life look like in the next six months? How will you continue to grow as a teacher, speaker, and writer? How will you expand your reach and connect with a wider audience? We filled the drive home with hopes and dreams, tears and laughter. It was the retreat after the retreat. The fires outside continued to blaze in combinations of red, orange, and yellow, helping to torch anything false that seemed to be holding us back and no longer works in our lives. The fires of fall seemed to clear the path and prepare us for how we’re ready to live. PrevPreviousAre you a WE or a ME?